The perfect introduction to one of the best-loved and classic effects in magic, the Cups and Balls. This beginner's set is Royal Magic's best seller of all time, and serves as a great foundation for the budding magician. For those unaware, the basic effect is as follows. Three coloured solid plastic cups are shown. Three unprepared balls are shown. 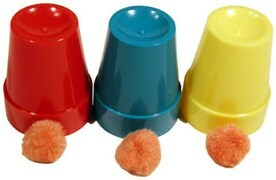 The balls then penetrate the bottom of each cup, time and time again. No sleight of hand is involved and many more routines are possible with this beginner's set. The perfect addition to any magician's toolbox of tricks, as well as an ideal gift for any aspiring magician - young and old. A beautifully crafted copper version of the classic chop cup.